Increase core strength and spinal flexibility with the proper awareness and mental focus to get stronger without getting hurt. Private sessions are tailored to your specific needs and level of ability. The goal of these sessions is to enhance your kinesthetic awareness in order to help recognize what is limiting your ability, and to discover options that can make things better. Sessions are done through gentle touch, movement explorations, and verbal guidance. The awareness you develop creates a foundation and stepping stones towards learning healthier, more functional, and more graceful alternatives. Pilates before hip, knee or back surgery, is about being in the best condition possible before surgery to insure a better outcome. Post Surgery Pilates Sessions can help you heal more completely, recovery lost ability, and get you back into your life faster. Back Care: Learn what you need to know about recovering from back injury, reducing chronic pain, and preventing re-injury. Discover the best ways to safely increase strength and flexibility, how to improve posture, lift properly, and move more efficiently, in order to return to normal activity. 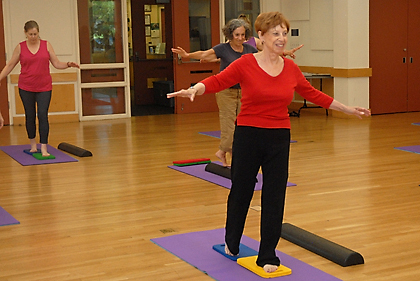 Fall Prevention/Improving Balance: Sharpen your balance reactions and develop strength and flexibility needed to improve balance and prevent falls. Learn how to protect yourself if you do fall, and how to get back up. Increase confidence and reduce the fear of falling so you can do more of the things you want to do. Easy Walking: Walking is rhythm and flow in action and one of the best things you can do for your health. Easy walking consultations can help you find your natural stride and re-discovering the joy and ease in walking. If requested, sessions may include training in how to use Trekking Poles for fitness and safety. VIDEO of exercises and written notes provided to clients to help them remember what they learned during a session (no additional charges). ONLINE COACHING for clients purchasing 5+ sessions. Stay on track with your exercise or rehab program (additional charges apply/see below). Stay on track with your exercise or rehab program via Skype, and Google Hang Out. Call or email for information. FEE POLICY: Fees are not refundable, yet are transferable, as long as I authorize it. Prepaid sessions expire 12 months after first session. CANCELLATION POLICY: Minimum of 24 hours before session is required, otherwise charges will be applied. ONSITE: Cash, Check or Credit Card/PayPal at beginning of first session. El Cerrito Fitness, 10833 San Pablo Ave., El Cerrito CA 94804: (Pilates Personal Training using Pilates equipment).